This Red Dead Redemption 2 Online money cheat for easy $$$’s an hour will show you how to collect quick cash by taking advantage of a secret trick in the PS4 & Xbox One Western action-adventure online game. Money Cheat Location: How to get more money? There’s an unlimited money glitch hidden in Red Dead Redemption 2 Online. •	Step #1: First, head to Valentine’s Ranch building. •	Step #2: Shoot and skin the pigs or sheep one at a time. •	Step #3: Take the animal carcass with you on your horse to the butcher in town (but steer clear of evildoers) and sell it for an easy $18+ two minutes later. 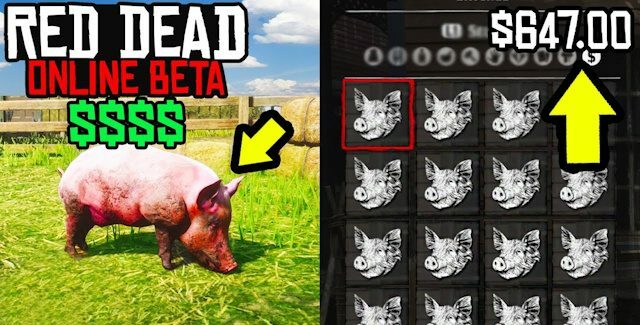 •	Step #4: Not only will you be able to do this with all the cattle on the ranch, during the die animals you killed there will have a chance to respawn! •	Step #5: Keep repeating steps 1-4.